Click on each image below to open a larger version in a new window. The brown stains you see on the sterile drapes in these slides are Betadine surgical scrub. The usual blood loss during the procedure is only 1-2 drops. And don't worry, I don't take pictures of every vasectomy! A very special patient allowed the filming of his surgery. Betadine cleansing of the skin after the rubber band and clip have been applied. Sterile drape has been applied. Injection of Carbocaine and Sensorcaine to numb the skin and both vas deferens tubes. 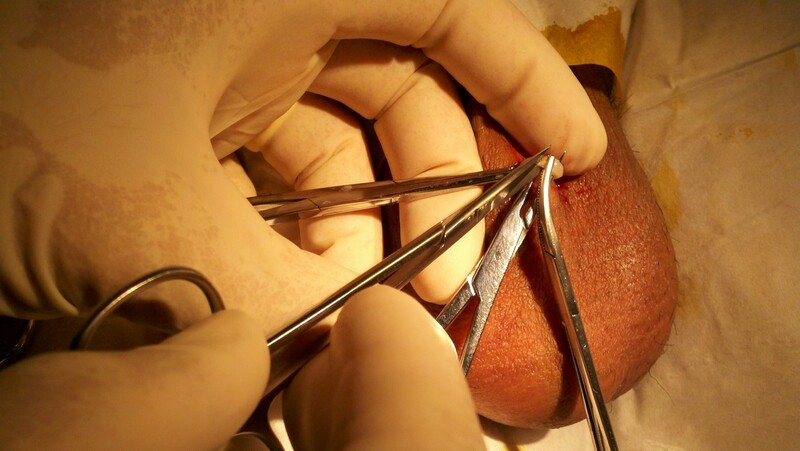 After anesthesia is complete, the ring forceps is secured around the right vas deferens and the skin is pulled up a little to provide access. Note how well the patient shaved for the procedure. Your procedure time can easily double if you do not shave just before leaving the house to come to the procedure. The skin is punctured with the vas dissecting forceps and opened just enough to allow access. The vas is delivered up out of the scrotum about 1/4 inch to work on it. The vas is cleaned of any fascia. 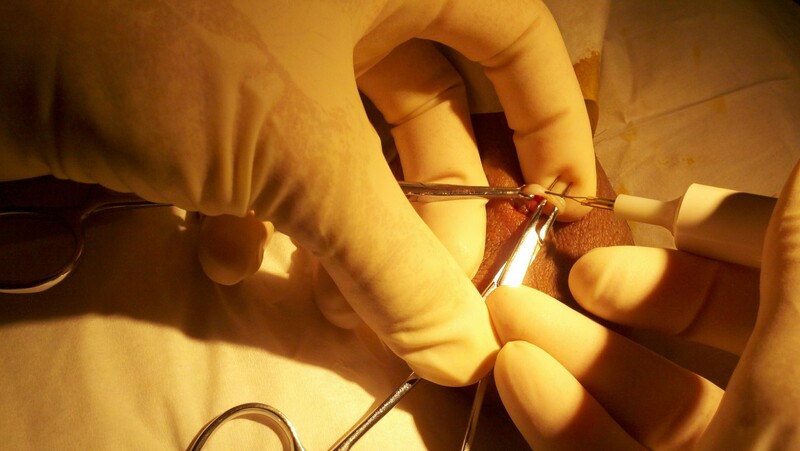 The cautery tool is used to enter the upper part of the vas and place a scar into it. The upper and lower ends of the vas are then separated next to the cauterized area. The testicular end of the vas is to the right and the prostate end is the cauterized end to the left. The prostatic/upper end is then sewn into the sheath that it was always in all its life. Picture 15: Conclusion of the sewing part. This also involves a suture through the lower part of the vas to cause it to scar in a position outside the sheath so it can never find the upper part again. At this point the testicular end is elevated slightly just prior to returning it to the scrotum to prove it was the right side that elevates with it. The left vas is brought up via the ring forceps and cleaned of sheath. When clean, the cautery tool is used to scar the inside of the vas. The top and bottom parts of the vas are separated. The two vas ends on the left are clear: the upper end is towards the camera, and the testicular/lower end is away. Sewing the upper end into the sheath begins. Not as clear as I would like, but the lower end has been sutured to the outside of the sheath and is still in the hemostat shown. 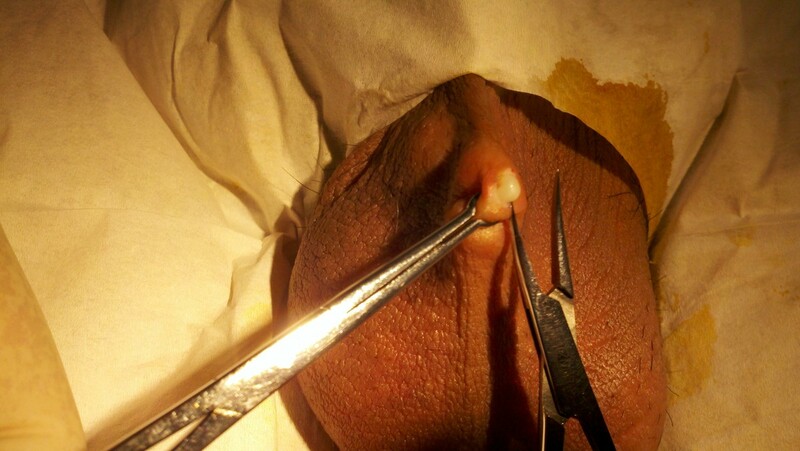 Sutures are cut just prior to elevation of the left vas end to prove it was the left one, and return of the vas into the scrotum. 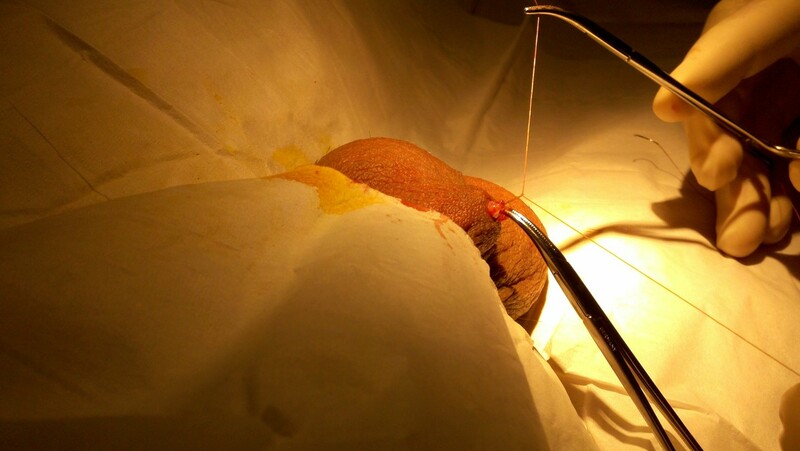 At the end of the 12-15 minute procedure, gauze is applied to the outside of the scrotum and the scrotum is not sutured to avoid the increased chance of infection caused by suturing. I help the patient by holding the gauze in place while they elevate their own underwear.